The business students at Villanova University received excellent theoretical instruction in the world of finance. But a few years ago, it became clear that something was missing. Theoretical coursework was no longer enough. "We received a wake-up call from Wall Street six or seven years ago," said David Nawrocki, professor of finance at Villanova. "The job market had become very competitive. Various alumni made it clear that our students were no longer competitive with other schools for Wall Street-type jobs in terms of their knowledge and their self confidence." The school decided that audiovisual technologies could help incorporate a more experiential aspect to the curriculum. Their idea: the Villanova Applied Finance Lab. "We visited other universities to see what they did, and what type of information and technology they used," said Nawrocki. "The technology was pretty simple, i.e. we needed computers that were powerful enough to run Reuters and Bloomberg, and we needed to display those within the room to the students." Nawrocki said they wanted the lab to be a classroom with video displays, a trading lab, and a library. They consulted with Villanova's computer center and graphics experts to design the video systems. The finance faculty brought their expertise to securing the needed databases, trading simulation software, and data delivery through Reuters, Bloomberg, and Wharton Research Data Services (WRDS). "Our philosophy was twofold," he said. "One, that it not be a 'white elephant' that looked impressive but had no real use, and two, that it not be another computer lab with rows of terminals." He said new curriculum and programs had to be developed "to prevent the room from sitting empty and becoming another very expensive 'Internet café.'" Instead, the finance faculty wanted engage the students by providing the same technologies that they would see on Wall Street. "We wanted students to be able to simulate trading sessions as well as have world class access to financial information," he said. "We wanted students to be able to work in groups as well as individually. We wanted it to be unique and not look like a computer lab or other university trading rooms." The finance faculty also needed to decide how the lab would be used for teaching. "Usage of the lab requires development of curriculum to go with it," said Nawrocki. "It's a disruptive technology that doesn't really lend itself to the traditional curriculum. While we were designing the lab, we were also working on new curriculum." The Villanova Applied Finance Lab is a non-linear room of 1,200 square feet. There are two 61-inch NEC plasma displays and four 40-inch NEC LCD displays in the room. A Crestron digital controller controls all of the input equipment and routes the data to the various display screens. The computer workstations (3.2 GHz desktop computers with three 15-inch LCD monitors), and network hardware are from Dell. 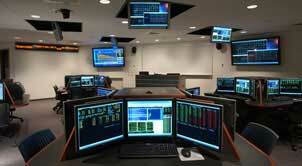 The 16 workstations feature 16 Bloomberg installations and 13 Reuters installations. "The computers had to be able to handle Reuters and Bloomberg, and they had to be able to handle the multiple monitors commonly seen on Wall Street trading floors," he said. The displays also needed to be viewable anywhere in the room. "We were also worried about sight lines throughout the room and to make sure that the workspaces were wheelchair accessible." Because so many fans are required to cool all the equipment, audio amplification was also important. There is a stationary microphone at the instructor's station as well as a portable microphone to be sure soft-spoken lecturers are heard. A ceiling speaker was installed over each of the four work pods, and the Crestron control system controls and audio sources. "We typically feed cable broadcasts (CNBC) through a VCR," said Nawrocki. "Also, the instructor's workstation includes a laptop docking station so any laptop computer can provide audio or play a DVD." The room is built for multiple uses, broken into three areas, including a small office for room administration, a classroom/lab, and a research area. "The separate research area allows students to continue to work on their own while classes are being held in the room," said Nawrocki. "All of our students working on Bloomberg certification work in the research area. The room capacity is 30 students and one lab intern/instructor." Nawrocki and colleagues developed a student-managed investment fund program that includes 40-50 students in two classes for academic credit, and about 100 students in a student club, the Villanova Equity Society. The students manage five different portfolios of about $100,000 each. "We developed a market microstructure course (trading) using material developed at Baruch College," he said, and we also developed a new masters program, the Masters of Science in Finance (MSF) that uses the resources in the room." The technology is sophisticated enough to be intimidating to new students, so they installed softer lighting than most labs, which tend to use uncomfortable lighting that glares, and student interns man the labs during open hours to offer assistance. "This allows students to work with students in overcoming the information overload that the lab represents," he said. The lab is a powerful recruiting tool for prospective students, and usage has grown from 20 students to more than 80 students earning Bloomberg certification annually. In addition, Villanova ranks in the top five universities in the country in terms of Bloomberg certifications. "Bloomberg certification is a powerful addition to a student's resume when interviewing for summer internships and for jobs," said Nawrocki. "Being able to quickly access almost any information from a Bloomberg terminal is a very marketable skill." Trading simulation software provides students with a better idea of how markets operate and it provides another skill set that is attractive to investment firms. "Reuters and Bloomberg in conjunction with the five investment funds that we manage motivates students to keep up to date with market developments and market statistics," he said. "Most interviewers for investment jobs really look for students who are able to discuss current market events." As for the university, he believes the lab has increased the value of a Villanova diploma. "The Villanova School of Business has been consistently ranked in the top 20 undergraduate business schools the past five years and the lab was a factor when the Princeton Review and PC Magazine named Villanova the number one most wired campus a few years back. The most recent Princeton Review placed us in the top 15 college campuses for computer technology." Personally, Nawrocki said the lab was a great adventure from the planning and design to the implementation and new curriculum. "The professional growth that I have seen in our students the past five years has made it one of the most rewarding experiences in my career."